Judge Cynthia Ebner, endorsed by the Stonewall Democrats, handed out sentences in the #BlackPride4 on Tuesday, March 13. Last week word was sent from the City Attorney's Office that there would be no jail time requested from the judge. The city attorney proescuting this case made this clear for all three of the #BlackPride4. Intense pressure put on the city of Columbus, including a National Day of Action to Free the #BlackPride4 organized by GetEqual and Black Queer Intersectional Columbus BQIC) on Monday, had an impact. 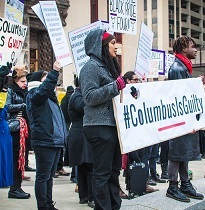 Supporters of the #BlackPride4 had simple message: #Columbusisguilty -- not the #BlackPride4 who were arrested when they held a silent vigil during the 2017 Stonewall Pride march. The vigil was to call attention to the murders of black trans people and killings of black people in Columbus by the police. Immediately, when the #BlackPride4 began a vigil in the street, Columbus Police jumped on them and brutalized them. Columbus Police who violently attacked the demonstrators had admitted under oath they were in violation of the "orders of the day" that dictated de-escalation tactics beginning with dialoguing with any protestors. The police had attacked within seconds of the start of the silent vigil. Ashley Braxton was sentenced first for a first degree misdemeanor for failure to comply with a police order, punishable by up to six months in jail and a $1000 fine, and a fourth degree disorderly conduct, punishable by 30 days in jail and a $250 fine. She received two years probation, 90 days in jail with 89 days being suspended, 60 hours of community service, and a $250 fine. Wriply Bennet had been found guilty on three counts including a first degree mismeandaor failure to comply, resisting arrest, and disorderly conduct. She received two years probation, 90 days in jail with 89 days being suspended, 80 hours of community service, and a $250 fine -- but this fine was waived. Her attorney Constance Gadell Newton pointed out that while there were white people protesting at the Pride march as well, only the black activists were targeted for arrest. She described Bennet as a "nationally renowned artist and activist." Kendall Denton who was convicted of a mere fourth degree disorderly conduct, the lowest misdeanor charge, but was given a surprisingly harsh sentence: two years probation, 30 days in jail with 29 days being suspended, 48 hours of community service, and a $100 fine -- with $50 suspended because he spent a night in jail. After completing half of their community service, Braxon, Bennet and Denton may write the judge and ask for a sentence reduction. All of them have the suspended jail sentences hanging over their heads if they violate probation. Also, they all have court costs. Judge Ebner acknowledged receiving hundreds of letters in support of the #BlackPride4's character and activism. Two dozen supporters crowded the courtroom Tuesday and an equal amount stood outside in solidarity. Deandre Miles, the fourth of the #BlackPride4 still awaits trial a felony charge. The arrest of the #BlackPride4 has created siginificant rifts between the more moderate Stonewall Columbus and BQIC along racial and generational lines. The BQIC plan an alternative Pride event year and encourage supporters to boycott the Stonewall Pride events. Stonewall director Karla Rothan stepped down from her position.